The Chairman of the Augusta National Committee decided yesterday that it was his place to address Tiger Woods’ ongoing fidelity and morality issues – before he was asked a question about it. Payne just felt that, yesterday, during his annual address to the media, that it would be a good time to chastise Tiger for his actions over the past few years. I guess I missed the moment when Payne was appointed judge and jury to all golfers who have made bad personal decisions in their lives. PGA TOUR Commissioner Tim Finchem has kept his thoughts about Tiger to himself. Because that’s where they belong when you are in that position. And that’s where Payne’s thoughts belong – to himself. I think, perhaps, that old Mr. Payne is getting a little big for his britches. Just because Augusta makes its own rules regarding membership-eligible persons (i.e. 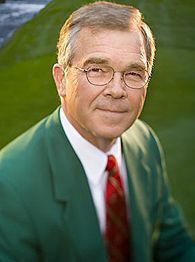 no women), Payne must think, because he oversees the anointed greatest golf course in the world, that he can pass judgment on any old little topic he chooses. This reminds me of auto racing magnate Tony George and his actions in 1994. At that time, George decided that his Indianapolis Motor Speedway was bigger than the sport of IndyCar itself – so he formed his own group, the Indy Racing League. George reasoned that no matter how little-known the drivers were, fans would still be drawn to Indianapolis as an event under the Indy Racing League banner. Fans were not impressed. All George did was drive a wedge into the sport that it took about fifteen years to wiggle out. Atta boy, Tony. Payne seems to think Augusta is Indianapolis – too big for the sport to do without. Lemme tell ya, if Bobby Jones hadn’t poured his heart and soul into Augusta at just the right time in history, none of us would have a clue where or what the place was. Period. Is The Masters the biggest event in golf? Sure, right up there with The Open Championship. Is it bigger than the game itself? Not a chance. Here’s a good idea, Billy. Go mow your greens. Keep your patrons on their figurative leashes. And shut the hell up about anything other than golf at Augusta National. Whether you like the way the elitists at Augusta run their club and their tournament or not, it is hard to disagree with what Payne has said. Tiger’s personal life has tainted his professional persona, maybe beyond repair. I don’t disagree with his opinion – just the forum he chose to air it. The guy is the front person for the most elite golf club in the world. His personal opinions should be kept inside his tiny, little head. There was not another golf-driven media or the PGA that dared to say what Payne said, because they are all dependent on Tiger. Tiger chose to re-enter at Augusta, a media-controlled forum. Until Payne spoke, no one else had touched the Woods scandal and it’s impact on golf. Finally, somebody spoke truth.